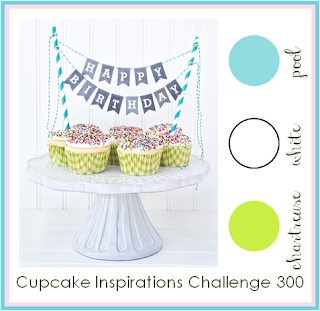 I am again playing along with My Favorite Things Color Challenge! I used Daffodil Delight, Crumb Cake, Cajun Craze, and Soft Sky. When you play MFT Challenges (they have sketch and color challenges), you enter for a chance to win a $15 gift certificate, and extra $5 if you use MFT products. I only own several dies, so it is pretty limited to make many different cards. 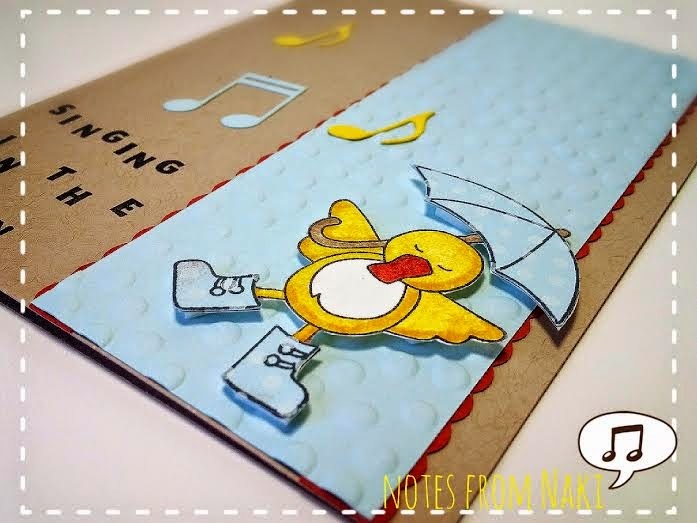 When I saw the colors, I knew I wanted to use this adorable ducky from the Spring Showers set from Newton's Nook. Then I looked through my MFT collection, the Musical Notes dies were it! I stamped this little cutie on the watercolor paper and colored him with Stampin' Markers and the blender pen. 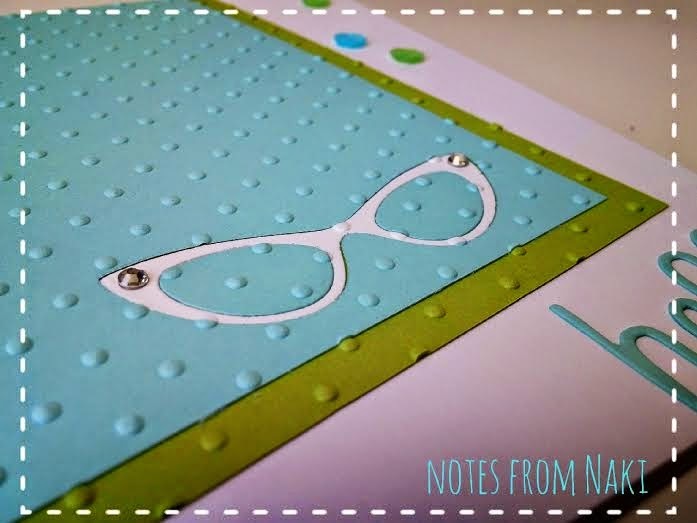 Then I stamped the Dot, Dot, Dot stamp on the Soft Sky cardstock with White Stazon, stamped the umbrella and the boots on top, cropped them out, then glued them down on the images on the watercolor paper. 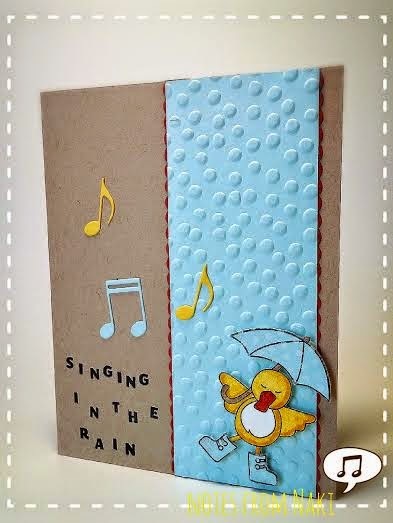 I thought the Decorative Dots Embossing Folder would look like rain drops behind the ducky. 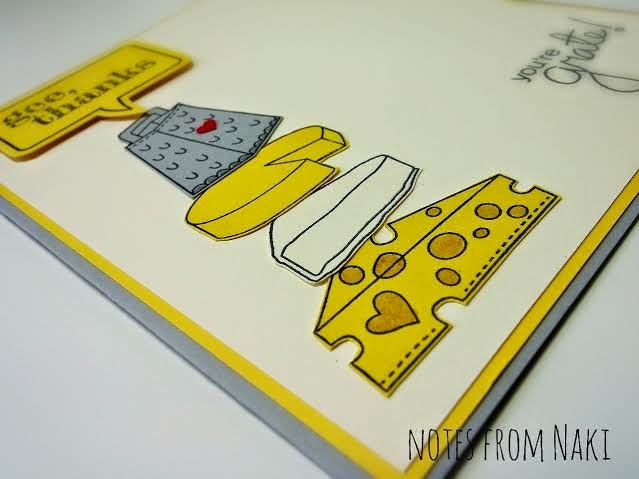 It was stamped with the very first photopolymer stamp set from Stampin' Up! Designer Typeset. Those teeny tiny alphabets are just so cute! I am playing this beautiful challenge that my challenge patrol Nina found, The Shabby Tea Room Challenge! Isn't this photo just beautiful!? 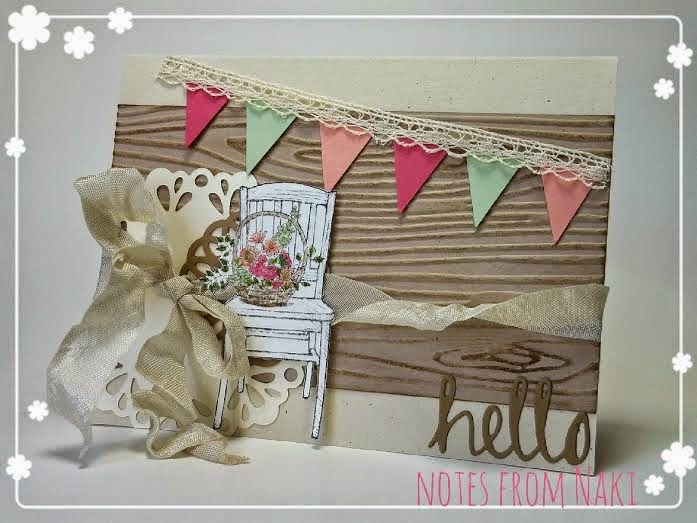 I LOVE shabby chic, but unfortunately, I don't really know how to make shabby chic cards:-( When I try, I think they come out just messy... BUT I had to play this challenge, this inspirational photo was giving me so many ideas! I tried to capture all the elements in the photo, plus some. 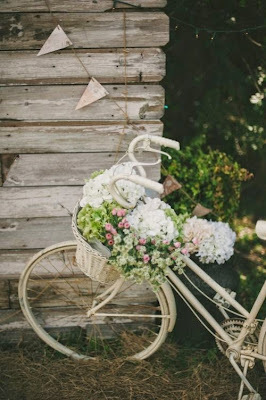 That beautiful chair with the basket of flowers is from the retired set, Cherish Friendship. 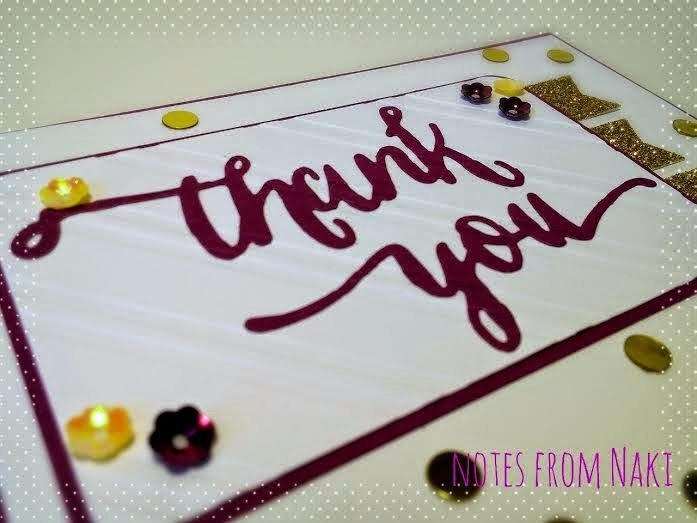 I stamped the image on the watercolor paper, colored it with Stampin' Markers and my trusty Blender pen. I actually colored the chair with the White Stampin' Chalk Marker, I thought it would look like old matte paint, but you really can't see it. 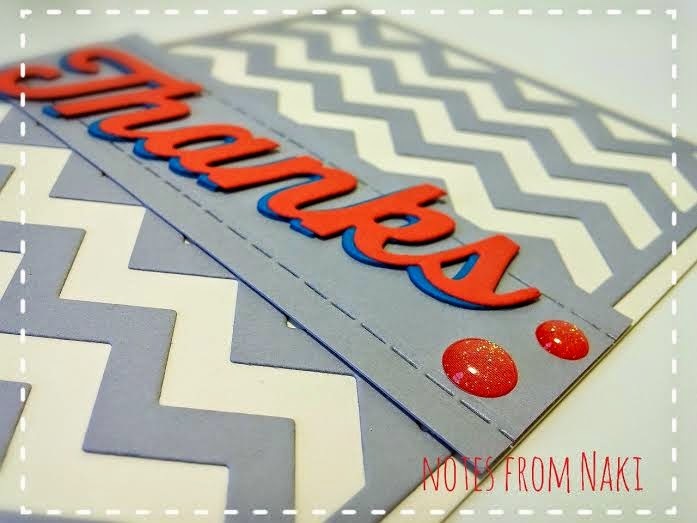 This gorgeous seam binding is from Paper Sweeties. I just love the way it is wrinkled and twisted! This color is called Oatmeal, it's a soft white with a hint of tan, I'd say it's between Stampin' up! Crumb Cake and Very Vanilla. I am going to need to order more colors along with their flower sequins that I am totally in love with! 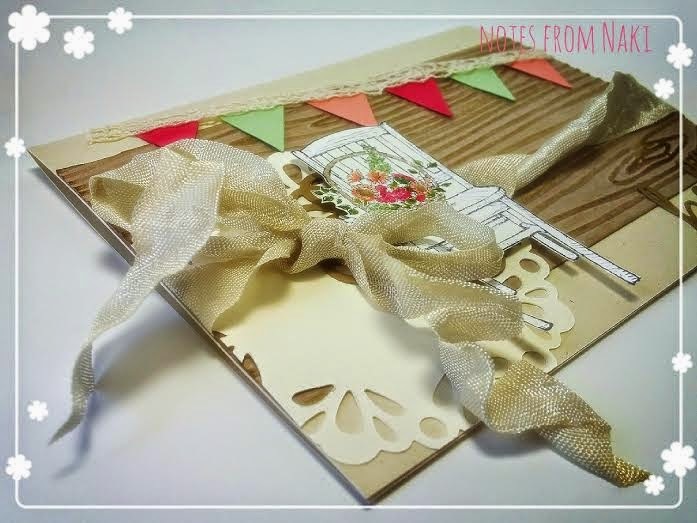 The basecard is the Naturals Ivory cardstock, which is perfect when I try to make a vintage or shabby chic card. It's got a rustic feel to it. It has been ages since I last played PPA! 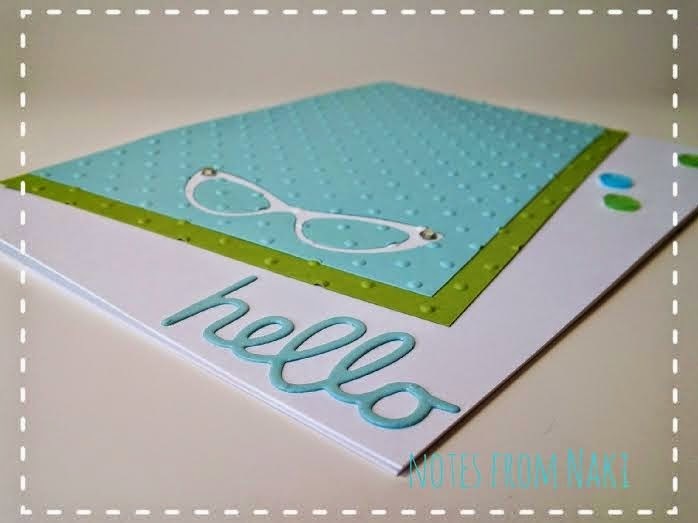 When I saw this sketch, my new stamp set from Newton's Nook screamed at me to be played with, so I did! Isn't this sketch so fun!? I'll say, this is one stinky card! That teeny tiny heart is punched out with the Confetti Heart Border Punch. 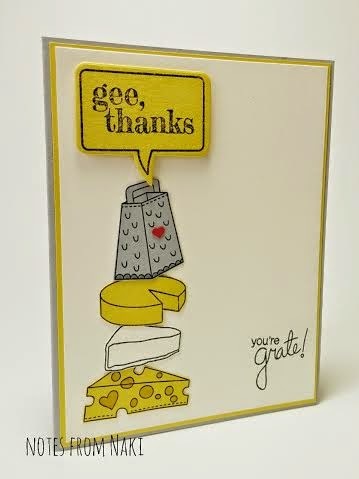 I love this sentiment... "you're grate"
Yellow and gray combo is one of my favorites, and it was just perfect for this card! This was super fun making, but super easy too! 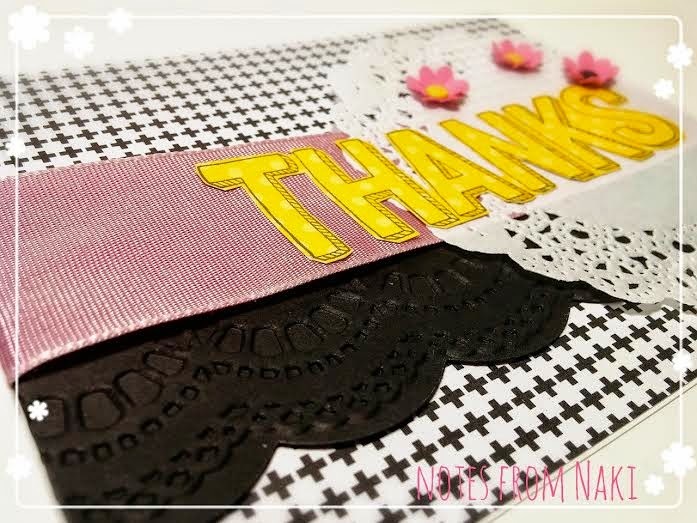 Tool: Word Bubbles Framelits Die, Confetti Heart Border Punch, Stampin' Dimensionals. Are you ready for another Double Dare Challenge!? 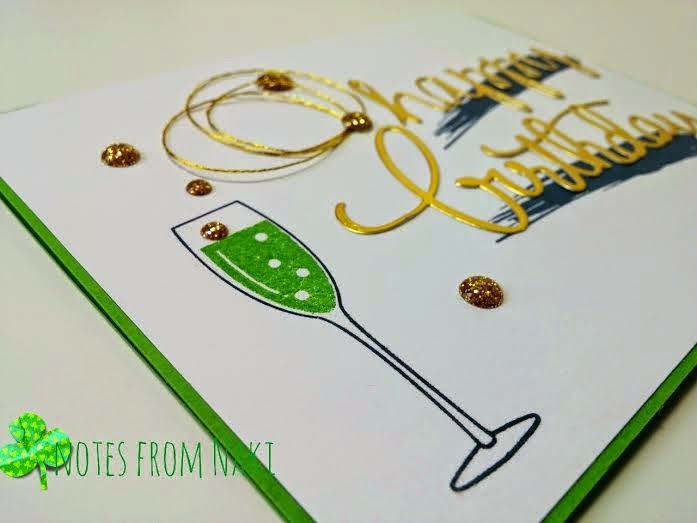 We have a very sparkly challenge this week! Do you see those delicate, beautiful flower sequins!? They are from Paper Sweeties, and just simply adorable! The Thanks you die is from W plus 9, isn't it fabulous!? 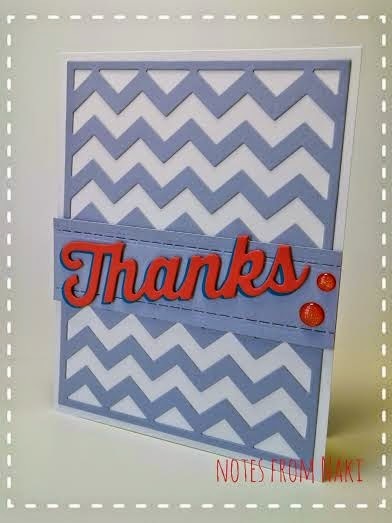 After adhering the sentiment, I embossed the Whisper White piece with the Stylish Stripes Embossing Folder. 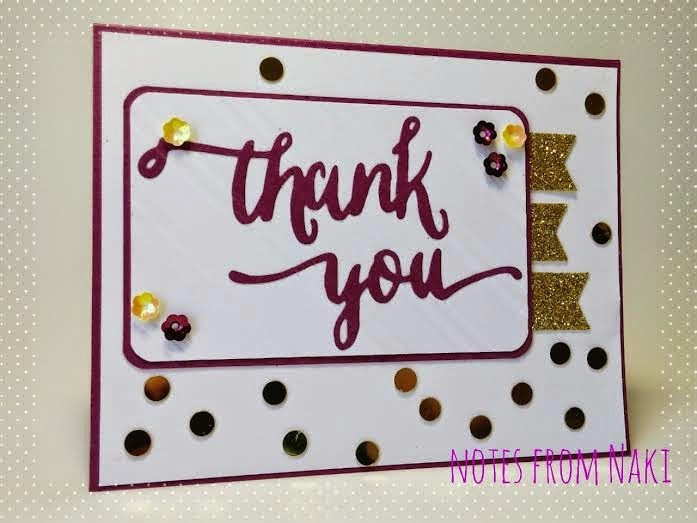 These gorgeous gold confetti are also from Paper Sweeties, so sparkly and pretty, I had to sprinkle all over my card! My little gold Glimmer Banners are punched out with the Banner Punch. 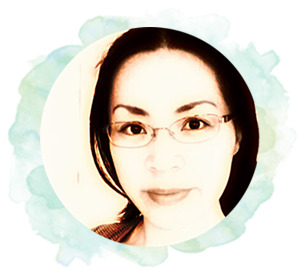 Now who wants to head over to Nina's blog and check out her always beautiful creation!? 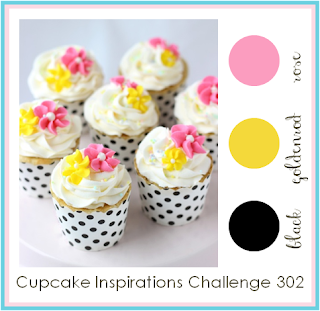 I am playing another Cupcake Inspirations Challenge! This card is so not me, it just isn't!. 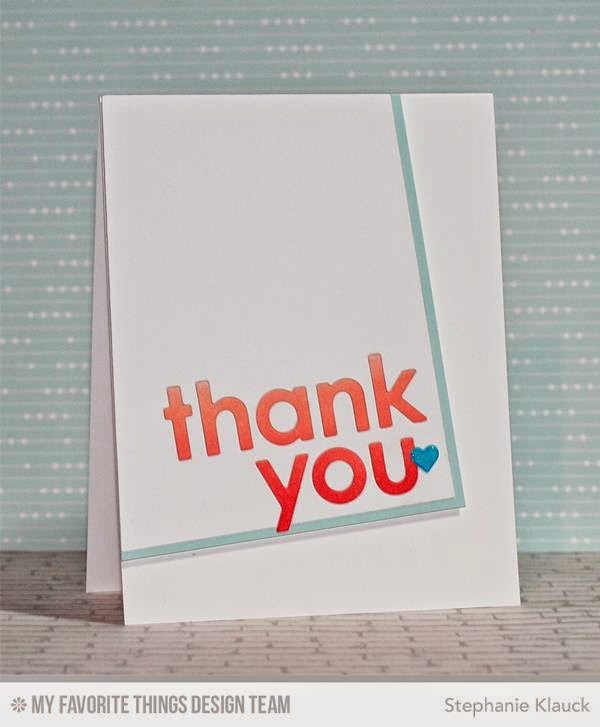 I wanted to use the new Sale-a-Bration freebie, For Being You. 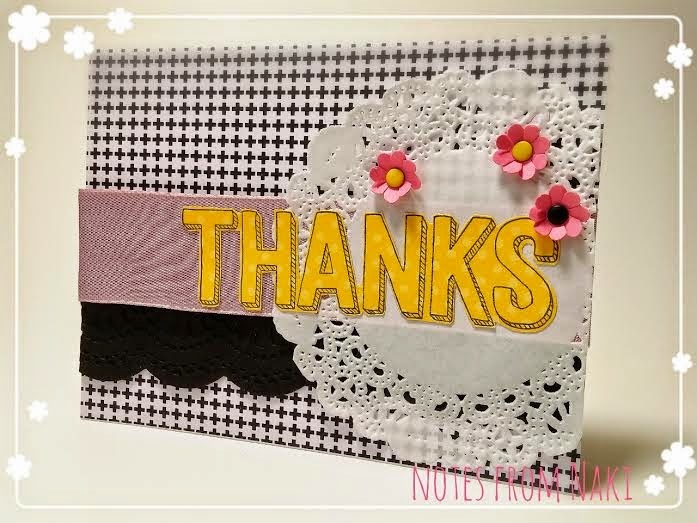 Isn't this big Thanks just so cute on the Daffodil Delight Polka Dots DSP!? 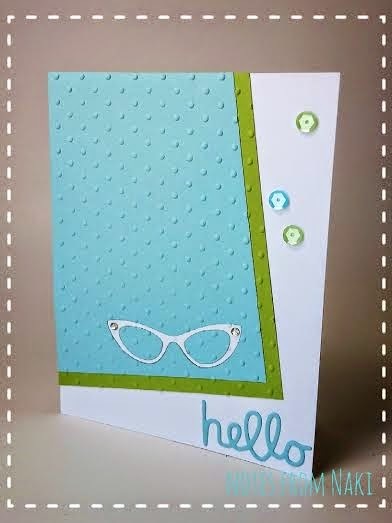 I love the Stacked with Love DSP Stack, so many cute designs! And here's something I haven't used for ages, Delicate Designs Embossing Folder. I had forgotten how pretty they are! That wide pink ribbon is I think from 2 occasions catalogs ago? I actually never used it til today! 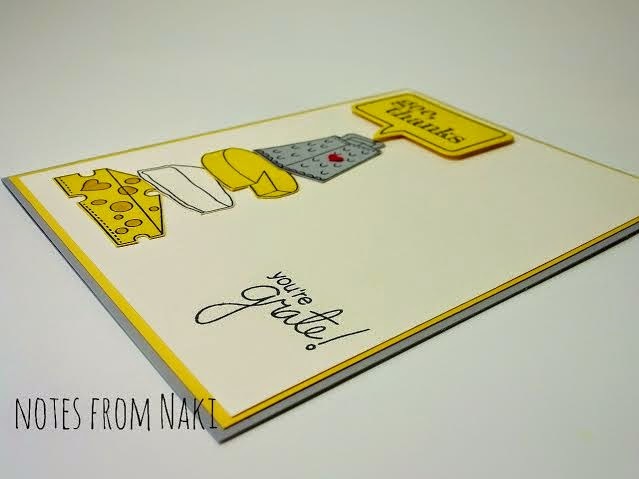 I have been trying different challenges and today's card is for My Favorite Things Color Challenge. I used Very Vanilla, Smokey Slate, Calypso Coral, and Island Indigo. 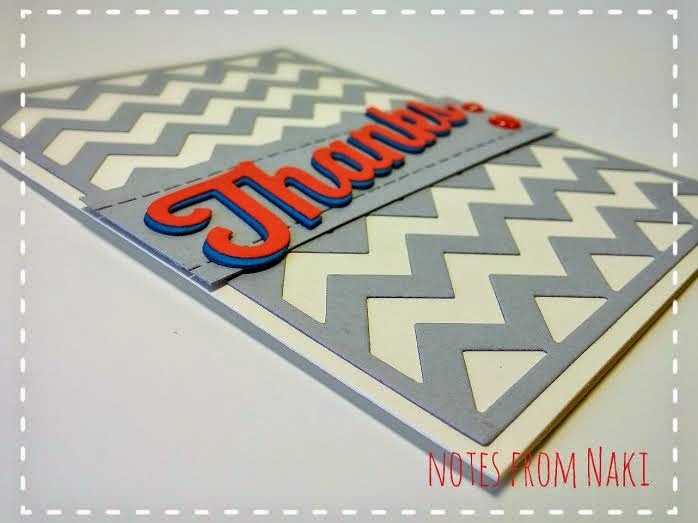 Isn't this chevron stripes die a lot of fun!? So here are my coral and indigo, I layered them for some depth and drama. 1-1/4" strip was added to break down the background. I love my new stitches die! And notice those pretty coral gumdrops? They're from Your Next Stamp and I am very much in love with them! It took some brainstorming to make this card, but I think it turned out to be a very fun card! Well, cold outside or not, I have a spring colored card today! So this is what I'm playing today, a fun challenge at Your Next Stamp. The reason I'm playing this is, I was shopping on their site (their gumdrops and glitter pen are fabulous!) and they give away a gift certificate to a challenge winner! I could get more gumdrops!? You can either use only the sketch or the color scheme (no need to use all the colors, you only need to use at least 3 of them), or use both inspirations. I chose both! I thought this sketch was simple, but I don't usually have a lot of layers so I struggled a bit. It's good tho, because I want to have more layers on my cards, and get more different sketches as well! Lovely spring colors, aren't they!? Don't they remind you of the In-Color 2013-2015? This sentiment die is from the Scripty Words Set. Oh boy, do I love them!! Meet my itty bitty fairy, Fhiona. Isn't she just darling!? I got a couple of mini stamps for $1 each (some of them are currently on sale) from Your Next Stamp. I thought I could use this lovely fairy as my tooth fairy when that time comes, but for this card, she was a spring fairy! Today is also my bestie's birthday! She was born on this lucky day, and her name is Megumi, which means blessing in Japanese. Pretty special, don't you think!? I wasn't planning on playing this challenge, I was partied out with them last week! LOL But, I needed a birthday card for Megumi, and I always tease her by saying Happy St.Patty's Day first instead of Happy Birthday, so this was perfect! They do not celebrate St.Patrick's day in Japan, maybe some Irish immigrants do, but I did not even know about it until I came to the US. So naturally, they don't make green beverages and food but I have told Megumi about green beers. 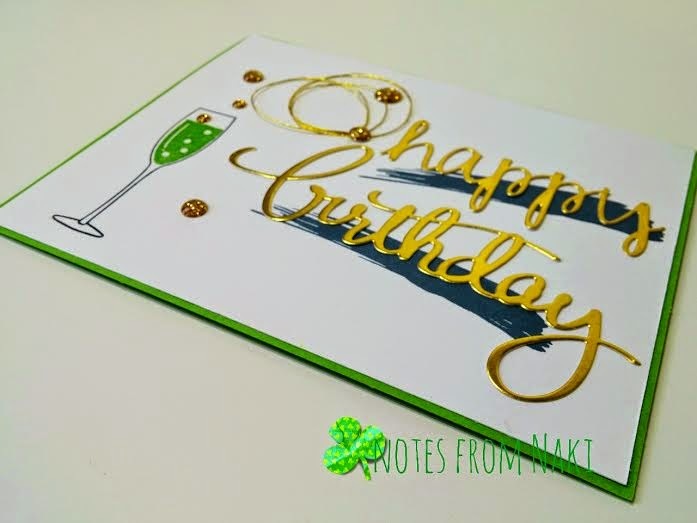 On her card, I made green bubbly with the Gumball Green Emboss Powder (Retired). I love Gumball Green, it's the green Ms.Kate Spade uses! 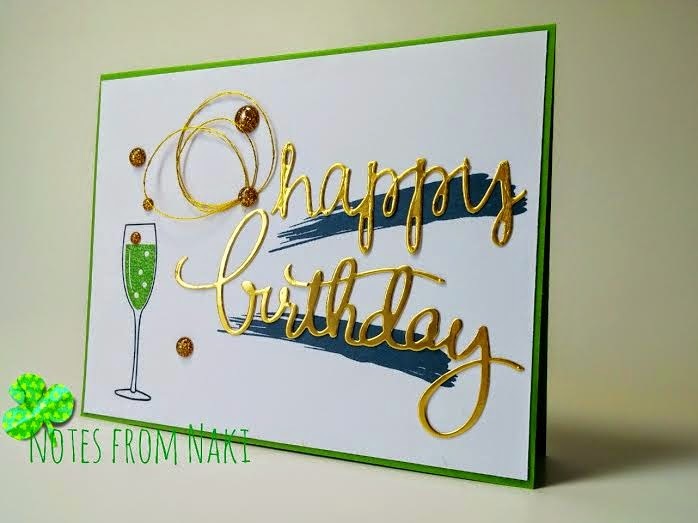 Those yummy gold bubbles are Gumdrops from Your Next Stamp, I am totally hooked! I am obsessed with sentiment dies lately. These two are from two different sets, but don't they look lovely together!? I see a lot of cards with those skinny strings swirled up lately, and they're usually tucked in behind something. I love the look of them, and Nina gave me this beautiful gold one so I thought I'd give it a try. What do you think? Today I wanted to share something different with you! 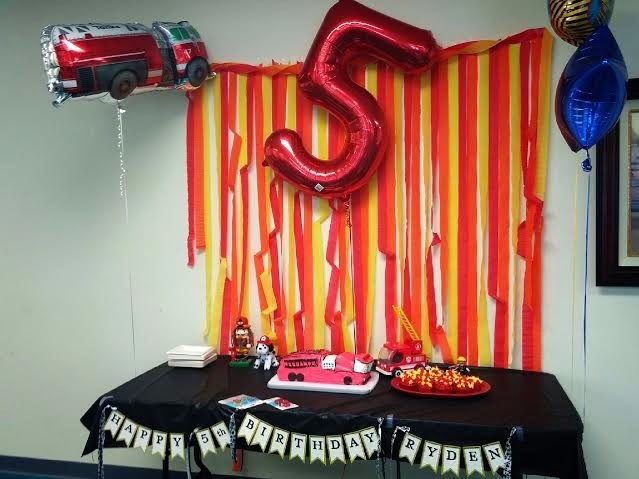 I threw a first big birthday party for my oldest son's 5th birthday 2 weeks ago. 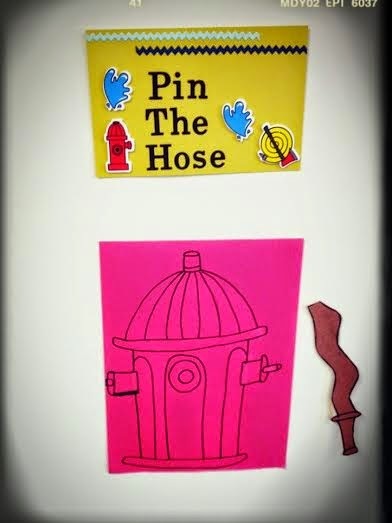 if you read my previous post about the invitations I made, you know that it was at this party room that the fire station rents out for anyone. We were supposed to go inside and start decorating 2 hours prior to the party but they gave us a wrong code for the lock box, and we could not find the guy who was in charge of it until only an hour before the party started, so unfortunately, I didn't get to take the before pictures of a lot of things... but here are some that we did take! Here is the cake table. I taped the red, orange, and yellow streamers on the wall like it was on fire! 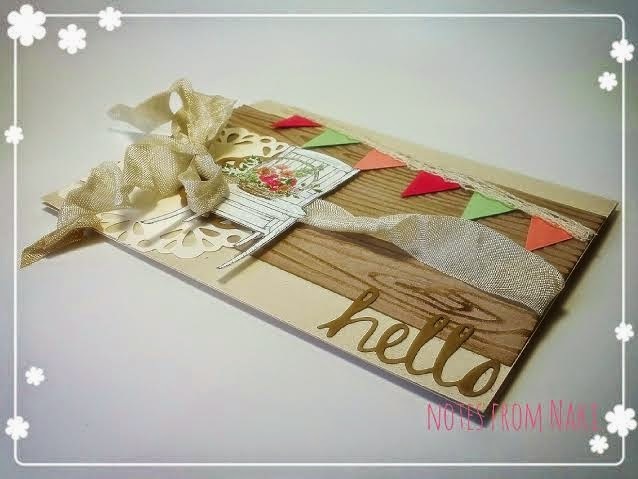 The banner was made with The Banner Framelits dies with the Very Vanilla and Summer Starfruit cardstock. I used the Typeset Alphabet Bigz die (Retired) and when everything was assembled together, I embossed them all with the Lucky Star Embossing Folder. To finish it up, I tied some white ribbons with black paw prints and plain black ribbon. Sorry about the quality of this photo, I had to blow it up. 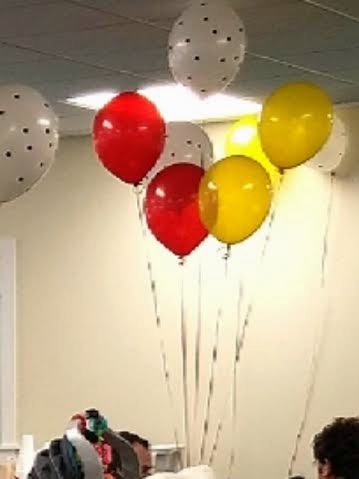 Red and yellow balloons as fire, and white with black dots as dalmatians. I stuck black circle stickers all over the white balloons to make those spots! The idea was found on Pinterest and it saved my life because I could not find them any where! 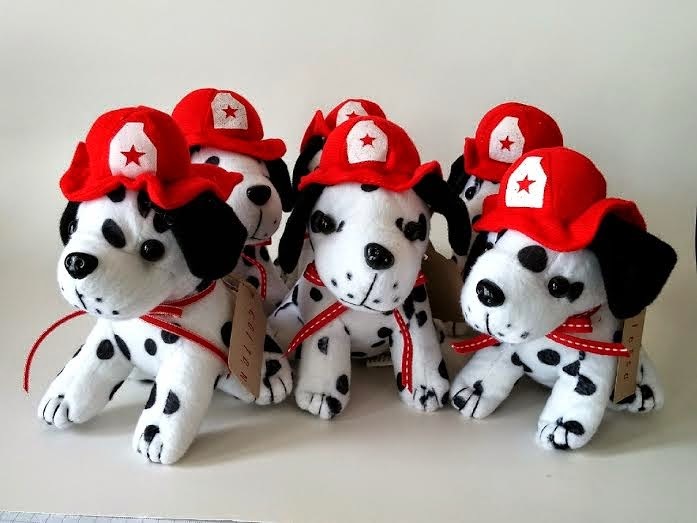 I bought a dozen each and tied them onto stuffed dalmatians, and they sat so cute on the tables that were covered with black tablecloths. We had several fun games for the little ones to play, super huge thanks to my husband's aunt, Jube (her name is actually Judy but my son calls her that) and I made quick signs for them. This is the only picture we took. But as you can see, I coordinated them all with the Summer Starfruit cardstock and Basic Black letters. Those cute firefighter stickers were some of the leftovers from the little prizes that I put in small cellophane bags. 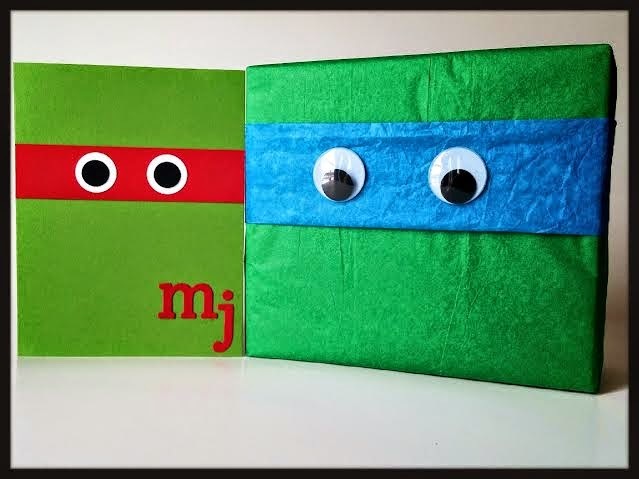 Here is a really cute craft for the little ones. 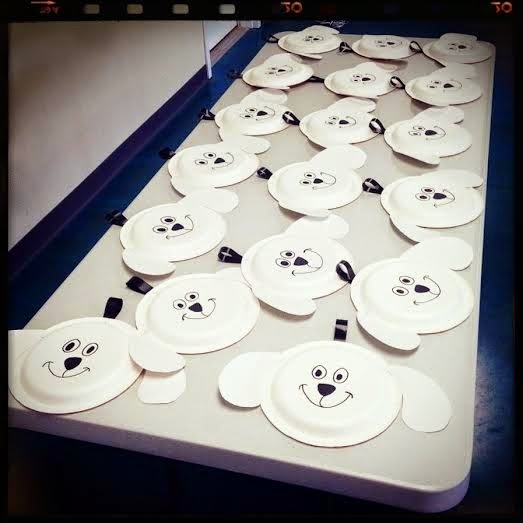 We gave them small black circle stickers, and they got to give their dalmatian puppies their spots! No mess, but super fun! We had these plastic fireman helmets for the little ones. 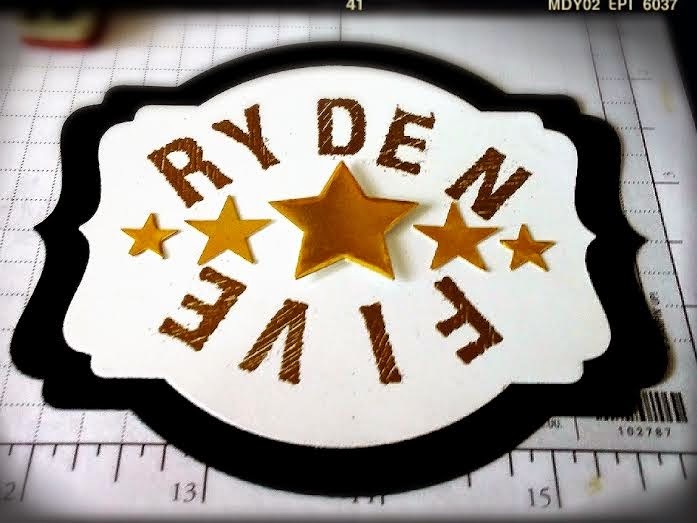 I made this special badge for my son's. 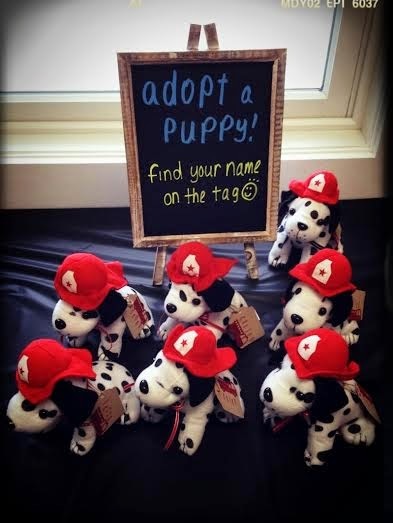 I didn't think they were exactly the cutest puppies I've seen, so I gave them pretty SU ribbons and name tags. Don't they look better!? Here are the name tags. 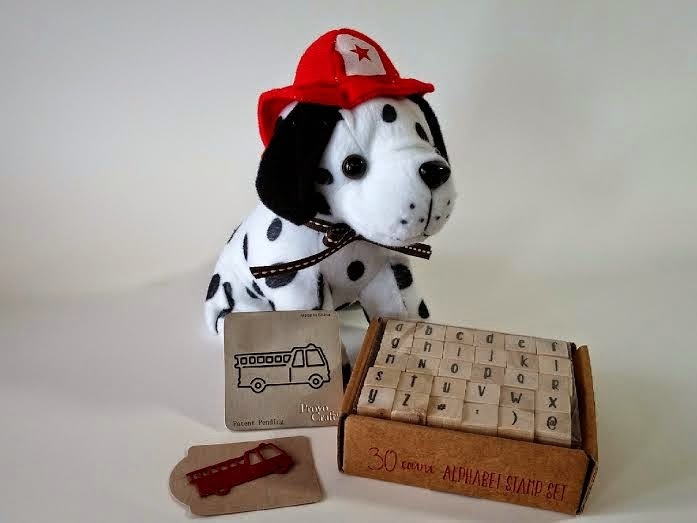 I found this cute little firetruck die on Etsy. That cute little alphabet stamp set is from Target's $1 shelf, this one was actually given to me by my lovely friend Nina because my Target did not have them! I LOVE the font, and how they mixed up upper and lower cases! So cute! 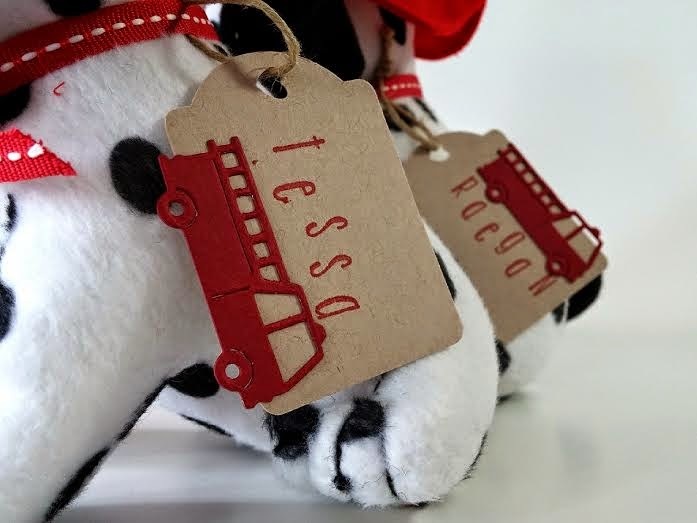 This particular pup has an Early Espresso ribbon because my son's favorite color is "Chocolate Brown"
The kids had so much fun playing all the games and craft, but the biggest highlight of all was the tour of the fire station! 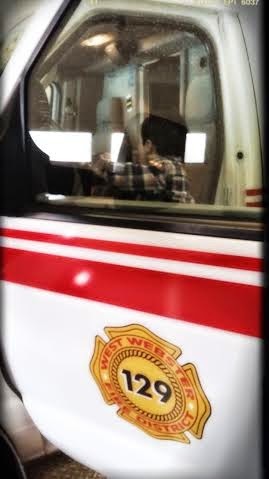 My husband's little cousin (he was only 4 when we got married, and although he now is a proud firefighter and a college student, he is still a "little" cousin to me) is a firefighter at this station, and lucky us, all the trucks and ambulances were home! So we all got to look, get inside, even turn the lights one and stuff! It was our private open house! Now, what little kid would NOT enjoy that!? Anyway, here's one that he was in one of the ambulances. 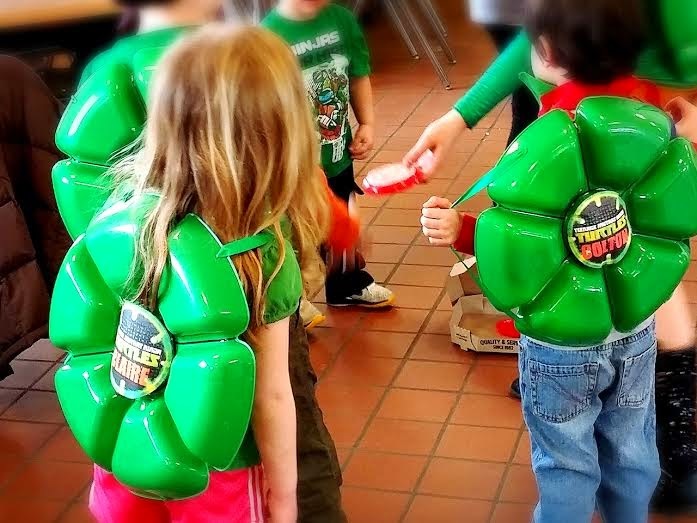 The birthday boy loves Ninja Turtles so the kids wore green, and his mom made the turtle shells out of green plastic veggie platters, and felt Ninja Turtle masks! So cleaver! 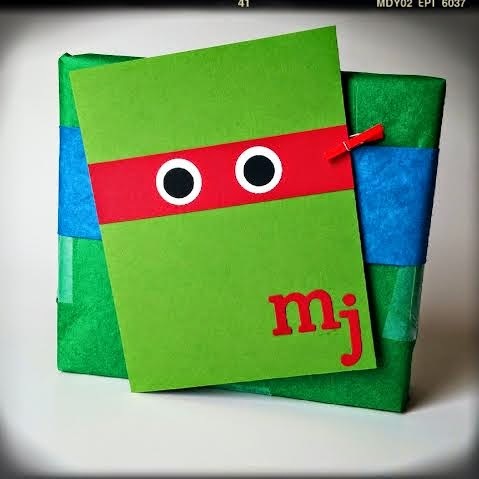 And this is the card I made, and the gift wrapping. I attached the card on the back of the present with that cute little red laundry pin that I had bought around Christmas at Target. I love their $1 shelves, but then, who doesn't !? My son's invited to 3 more parties the next 2 months, and there will be at least 2 more in summer! I will be making cards and cute wrapping, so stay tuned! 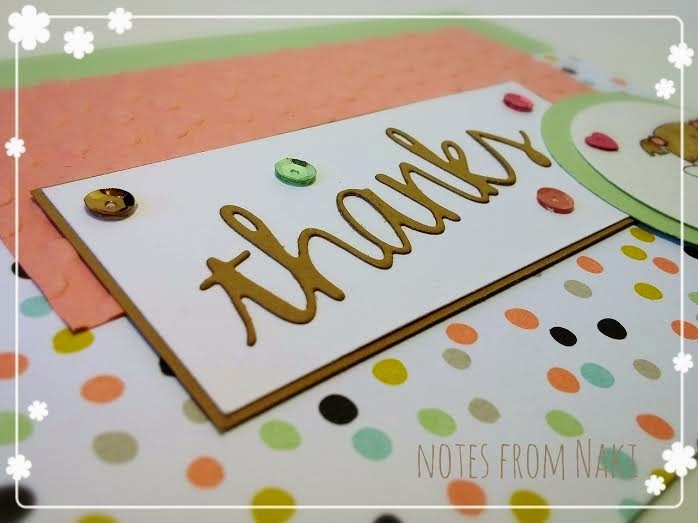 Thank you for reading this long post, I hope you enjoyed it! I hope you're not sick of me this week! 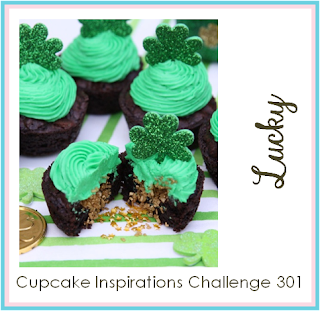 Just in time, I am entering my 3rd and last card to Cupcake Inspirations Challenge! Have you seen this layout a lot lately? 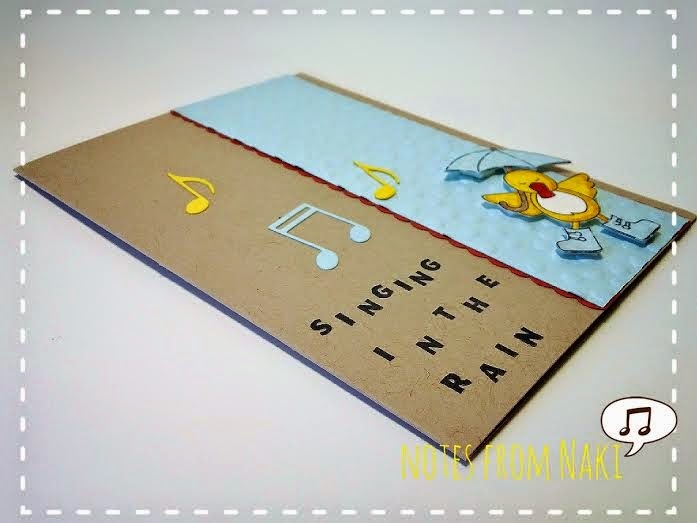 I didn't really like it first but I found this card below on My Favorite Things Facebook page, and I had to try it! Isn't this just simply gorgeous!? And look at these fresh, yummy colors!? The layout and the colors went just so beautifully together! Unfortunately, Stampin' Up! does not make chartreuse so I used Pear Pizzazz instead. When I found these glasses die (it came with 2 pairs), I loved them but asked myself, what am I going to use them for? but I ordered them anyway just because they are so stinking cute! Well, I certainly am glad I did!! This cute little hello came from my partner in crime Nina. She was sweet enough to die cut several for me, and she knows me so well, one of the colors she used was my favorite, Pool Party. It was like she knew I was going to need one! Of course you have to have some blings, right? I am loving those little sequins that Nina and I purchased together, just lovely!